Images are a quick and easy way to add color, life and personality to your business, whether being used for your website, new products, marketing materials or in presentations. However, simply copying and pasting from Google Images or from other sources online could result in lengthy and expensive legal battles over correct image usage. Despite a wealth of stock image providers hosting millions of images, companies of all sizes are regularly facing legal issues for failing to question whether they are legally entitled to use images for their own purposes. In January this year, the Court of Appeal upheld a ban on Topshop selling a T-shirt featuring an image of pop star Rhianna. Taken during a video shoot in 2011, the image was obtained without her permission. It was the first successful celebrity case of its kind and Topshop’s parent company was sued for £3.3 million. Without the appropriate release in place, the organization left itself vulnerable to this expensive and embarrassing lawsuit, showing that even huge corporations can suffer from a lack of consideration of image usage laws. In another example, Nestle was forced to award $15.6 million in 2005 to a model whose image was used on Taster’s Choice coffee product labels without correct permission. Following the original photo shoot in 1986, the model had signed a contract stating he would be paid $2,000 if the image was used in Nestle’s marketing. Although the image wasn’t used until 2002, ignoring the conditions of the release was a costly mistake for this international brand. A release is a signed document which ensures that the people or property (works of art, trademarks, brands or buildings) included in an image or clip are safe to feature. While most stock image collections clearly identify where a release has been signed, further limitations may be in place so it pays to always double check. 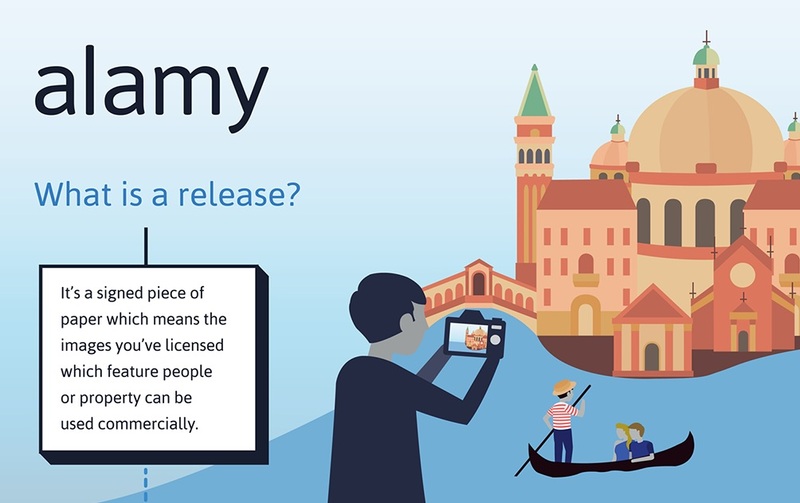 At Alamy, we make it clear as to which images have had releases signed, we’ve also developed an infographic to help ensure you don’t find yourself in trouble. You can view or download this here. Changing the image by 20% does not make it safe to use: If you use someone else's copyrighted work in any way you are violating the copyright and potentially liable for a lawsuit, even if you've changed the look of the image. Google's image search is NOT public domain: Copyrights last for 70 years past the owner's death, so it's likely that most images online will still be under copyright. Never use an image from a Google search without the correct permission from the owners. Crediting the owner for the image does not override copyright laws: Check carefully before using an image, particularly for commercial use and, if in doubt, contact the image owner directly for permission. Do your research: You don't want to spend money on an image to features as part of a campaign or on a product if it has been used in a similar capacity before. Check to see where else it has been used. Google Images is a good resource for this. Make sure your image is relevant: You might fall in love with a picture, but always check and double check if it's relevant to your content. There's no point in spending money on an image which you won't be able to use. Check whether you need a release, and ask if you're not sure: It is your responsibility to make sure that the image has the necessary releases in place. Ensure your chosen image(s) has the appropriate release in place: It should be clear on the site as to whether this is in place or not. If in doubt, call and ask or check with your lawyer. Copyright and IP law is complex and you don't want to find yourself in hot water after you've spent money and time building up your business. It's easy to get carried away when you've found the perfect image but getting the basics right is important to make sure your SMB is a success!